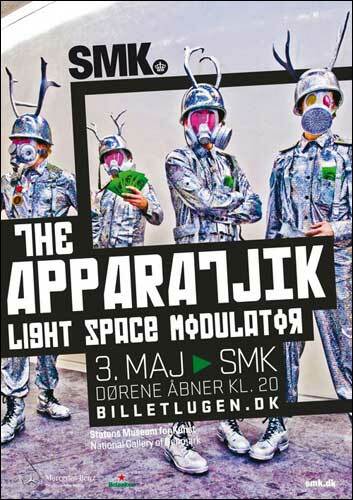 Apparatjik returned to Denmark, this time with the Light Space Modulator, for a concert at SMK in Copenhagen. 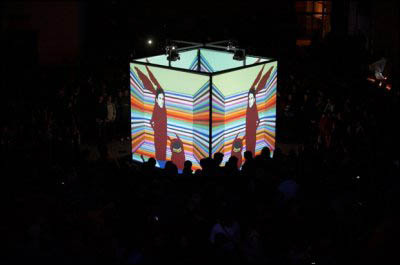 Facebook event: Appratjik will bring their light space modulator to the National Gallery Of Denmark ! Win tickets to the concert from Gaffa.dk. Apparatjik featuring Jonas Bjerre dissolved the boundaries between rock concerts, performance art and video art at the SMK. Short and stunning. “End Of Communication”, state the four squares that together form the Apparatjik Light Space Modulator. A huge cube that for the last 49 minutes has been the center of the artistic escapades of the supergroup; most of the times with the four members – Jonas Bjerre from Mew, Guy Berryman from Coldplay, Magne Furuholmen from a-ha and producer Martin Terefe – inside it. 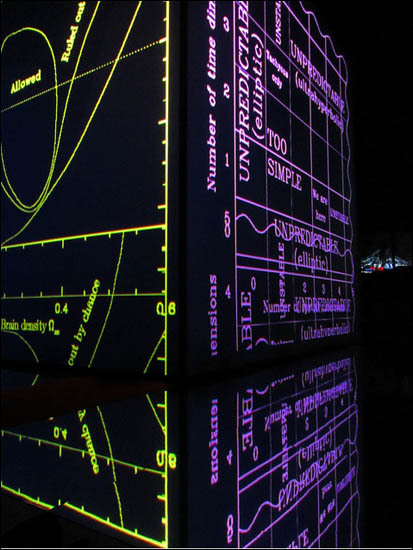 Only visible as silhouettes on the four canvases that make the sides of the cube. The audience is confused about the short length of the concert. People next to me discuss whether there is an intermission. Many are disappointed, and after about 10 minutes of applause even the most persistent spectators give up hope on expecting an encore. 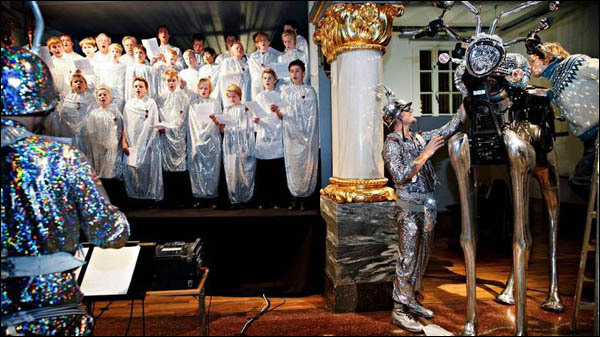 But perhaps these clear-cut 49 minutes were a clever disposition after all since Apparatjik have chosen to perform within these – literally – narrow limits. Limits that they have filled out to the max in an extremely and diligently arranged audio-visual bombardment of the senses; even though the visual part of the show was overwhelmingly cool and fantastic, a whole rock concert performed as Black Light Theatre would become a bit monotonic. The audience only experienced Apparatjik in flesh and blood on three occasions; when they got on stage, when they got off stage, and when they stepped out of the cube to accompany guest singer Lowell on the beautiful ballad “The Birds”. Or rather: Two band members carried a Wurlitzer piano played by a third bandmember wearing boxing gloves, while the fourth band member acted like a bird wearing cardboard wings and a beak made of tinfoil. All four of them in silver-lamé uniforms and helmets with antlers attached. All this happened while Lowell ran around looking like a lost and trashy elf girl. A highlight of the show, and a bizarre scenery which is way apart from a traditional rock concert. It would have been fun to experience the Apparatjik boys stepping out and do another stunt. But as said before, they also looked fabulous as silhouettes inside the Light Space Modulator, and the concept was in a technical way extremely well done. The silhouettes almost got a three-dimensional effect and there was a strong rock concert-related energy in the projections of the band members as the projections were mixed with video, graphics, colours and animation. In a musical sense Apparatjik are hardly as experimental as they are in a visual sense. Their pumped-up techno-rock sounds well and is arranged perfectionally and without compromises. It is a sort of luxuriously designed music where everything sounds good; but never quite edgy or dangerous, in spite of the experimental starting point. The weakness is that there is too much brains and too little heart. Apparatjik get close at some points, but it is never a strong emotionally form of music that grabs you by the heart. Apparatjik are mostly human thanks to their sense of humour and their nerdy fascination of science that bleeds through quite a lot of places in the songs. The National Gallery was the perfect setting for this event that basically mostly had a character of performance art and multi-media-video-installation-whatever-art event. Therefore it also is impossible to rate it based upon the normal preferences for a rock concert. I therefore conclude that Apparatjik gave the audience a successful, well done and thorough show that worked extremely well during these compact and clear-cut 49 minutes. Post by Statens Museum for Kunst.